Equipped with a thermistor these high quality fans regulate their speed based on an increase or decrease in the temperature surrounding the probe. Excellent for Aquarium Canopies, enclosed stands and equipment cabinets. Variable speed control (based on ambient temperature) between 28 and 60 CFMs.18” thermistor regulates the speed of the fan based on an increase or decrease in temperature. The mounting screw holes are 2 7/8" apart. IceCap has been introducing innovative lighting products into the aquarium hobby for more than two decades. The company is committed to producing benchmark quality products and has set the standard for efficiency and reliability. IceCap is committed to nurturing and supporting an increasingly self-sustaining hobby of coral reef enthusiasts. IceCap started the R.E.E.F. Foundation to encourage and facilitate recycling, education and a more conscientious use of both living and material resources. We carry a variety of IceCap aquarium lighting supplies including bulbs, fixtures, retrofit kits and accessories. 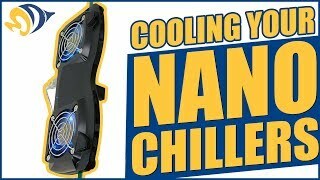 A fan that cools that canopy and doesn't sound like a tank. It's operation is quiet and I hardly notice it's on. Has lowered the temp in my tank by 2 degrees+. Don't know when fans shut off - hasn't happened in past four days. Product comes with no instructions or suggestion for placement.